Feeding dogs quinoa, healthy hound or poisoned pooch? Clean eating is a big deal. Not many of us have escaped the healthy eating revolution or the gluten-free tidal wave. If you’ve embraced super foods yourself, you may want to pass the health benefits onto your dog. But is feeding dogs quinoa a good idea? Despite being used as a grain, quinoa is a seed. Related to spinach and Swiss chard it dates back over 3,000 years. With an impressive nutritional profile, it comes in white, red and black varieties. And it has gained popularity because it is gluten free and contains all nine essential amino acids that are essential for health. Because our bodies can’t produce these amino acids, we have to get them through our diet. They are key to our immune systems, muscle strength and the formation of blood cells. Each cup of quinoa contains a whopping eight grams of lean protein as well as an impressive range of vitamins and minerals including, vitamin B, vitamin E, iron, zinc, and potassium. With so much in its favour, it’s no wonder that more people are feeding dogs quinoa. It is also making its way into commercial dog foods where it replaces other more calorific protein. 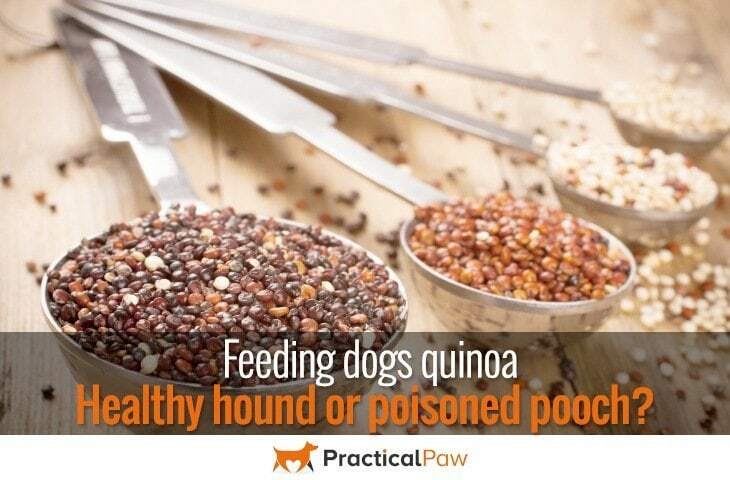 But should we be feeding dogs quinoa or are there risks? Is quinoa good for dogs? There is a good argument that supports the claim that it is. Quinoa is a great source of complex carbohydrate. Along with a low glycemic index it makes a good alternative to other grains such as rice. Because of it’s unique nutritional profile it is suitable for diabetic dogs. It is gluten free and lower in calories than other grains, so it’s also a great choice for dogs that are overweight or that have sensitive stomachs. Quinoa is easy to digest and contains prebiotics which are vital for healthy digestion. And it packs a powerful punch regarding vitamins and minerals as well as fiber. So are there any downsides to feeding dogs quinoa? There is a counter argument that grains, even pseudo grains like quinoa do not belong in a dog’s diet. Since our dogs have a very different digestive system to our own and some do not tolerate grains or seeds well. If you do want to give your dog quinoa then always start with a small amount. As with any new food monitor for any adverse reactions before you increase the amount or frequency that your dog eats it. Before feeding dogs quinoa, always wash it thoroughly and cook it. It has a bitter tasting coating to deter birds that is mildly toxic. Most commercially available quinoa will have been processed to remove these saponins it’s always worth rinsing it again. Is feeding dogs quinoa a good idea? 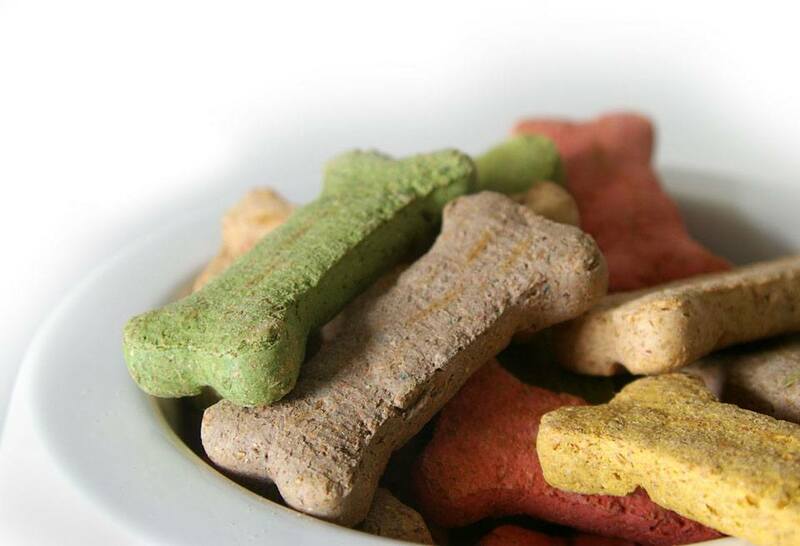 Yes, in certain circumstances it can be a healthy treat for your dog. Quinoa has a low fat, low allergen, and high nutritional profile which means that it may be suitable for dogs that may not otherwise be able to tolerate grain based food or treats. So if you fancy whipping up a batch of healthy treats then why not try one of the recipes below. Overcook the quinoa – you want this super mushy to the point where you can’t tell one seed from another so don’t follow the normal cooking instructions. Use about 4 cups of water and after bringing to a boil simmer for about 45 minutes. Keep an eye on it; you may need to add extra water to keep it from drying out. Add the whole jar of peanut butter and stir well, should be a rather thick consistency. Scoop into a mini muffin pan, no need to grease the pan because the peanut butter provides plenty of oil. Cool completely before serving. Makes 36 large treats. Add your sweet potato and coconut oil, and mix until well combined. Don’t worry about getting it completely smooth. Add your flour, about a half cup at a time, until your dough begins to stick together and release from the sides of your bowl. On a floured surface, roll out your dough to 1/4 inch thick and cut out your treats. Quinoa flour is not as elastic as regular flour, so you may have to roll in batches if your dough breaks apart easily. Bake your treats for 20-25 minutes, then turn the oven off (or as far down as you can make it go) and let them sit and dry out for another 45 minutes to an hour. Take out your treats and let them cool before putting them away. Add chopped carrots and sauté for about 4 minutes till they get soft. In a medium size stockpot, add the water and bring to a low boil. Add carrots and zucchini to the broth and turn heat down to a simmer. Stir and turn off heat so soup cools down to room temperature. Garnish with parsley if you want and serve to your pup or cat to warm them up!